I was talking to a non sales and marketing friend yesterday and he said, that everything we do today is about data. He went on to tell me about a famous supermarket in the UK, Marks and Spencer that sell sandwiches. They do this based on a number of factors, whats been sold before, the weather, the location etc etc. They can predict which sandwich you will walk in and buy. For many years this was done by people, then 10 years ago they automated it. We then talked about how manufacturing, supply chain, Finance etc, pretty much every departments apart from sales and marketing use data in some shape or form to make decisions. My colleague Alex Low, talks in a workshop he runs about the sales and marketing view on reports, that we still say, "I think" ...... why are we not saying "I know." "I know these 10 people are involved in the decision in this account and we have met them all and have a relationship with them." "I know if we run this campaign into this sector it will have a pipeline uplift." "I know that these people in these accounts are currently evaluating products and services that we sell." "I know this account is about to make a decision in this area, we are not talking to them, I'm going to disrupt that opportunity against the competition." Maybe this is why growth leaders have a data scientist in the marketing department. While I can see "traditional" marketing operations (which will look backwards on data) now seems to be business as usual. How about using both first and third party data and looking forward and making some predictions? The rest of the business has been doing it for years! 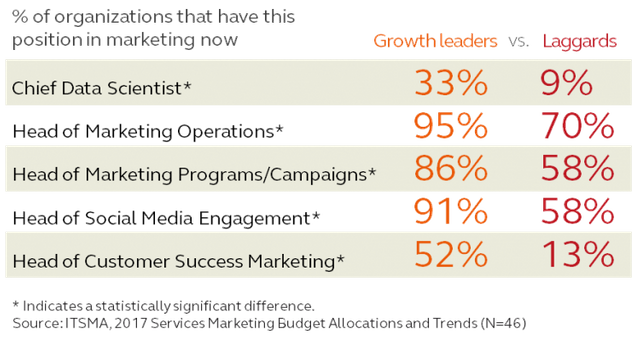 2017 study revealed significant differences in investment priorities for marketing teams at higher- and lower-growth organizations, for example, with higher-growth companies much more likely to emphasize leadership roles in critical areas such as data and analytics, marketing operations, and customer success marketing.